If you're a regular reader of our blog, you will know that we love getting arty and that painting is one of our favourite activities to do (just check out the "Arts and Crafts" category in the sidebar to see some of the arty activities we've shared). With this in mind, it seemed like a natural choice to give my creative daughter a fun and unique birthday party where she could get messy and creative with all her friends. Pick up colour charts like this for no cost, from most places that sell paint. Our water table was great for storing and washing all the painting supplies in. There were plenty of "Invitations to Paint" and be creative set around the yard. I tried to keep the food quite simple this time, with only a couple of themed foods (unlike our Dinosaur Party!) as the emphasis was more about getting arty and being creative with friends. I also didn't get very good pics on the day as there was just too much party action going on. Never mind, you get the idea. I had intended to have a number of the kids canvas art work behind the food table as decoration but I forgot to bring them downstairs. My Arty Angled Jelly was my favourite food from the party. A word of advice if you are making and serving these though, is that they are not great in really hot weather outside! haha. So, I didn't get any good shots on the party table but here they were inside before the party started. Try serving dips etc in new paint pallets to keep with the theme. This party had a bigger emphasis on the fun and activities than on the food. Apart from the "Poison Paint Ball" game, all the activities were set out with no pressure on the kids to participate or create anything in particular. Keeping it open-ended and flexible made it easier to organise, less stressful on the day and the kids could try out the different activities in their own time following their own interests. After Painting Big on our own, we knew this was a great activity that we wanted to share with our friends. We stuck large section of paper on a brick wall outside. It required a fair amount of tape to keep it in place but once it was up, it stayed up which was great. With this I supplied a range of coloured paints (easy wash finger paint), water pistols, brushes, rollers and other stuff for painting. For those that felt like getting a bit crafty and for a quieter experience, I set out a little craft table with some cardboard mask shapes (I got a packet of animal shaped ones for a couple of dollars from a dollar shop), glue, sequins, feathers and markers. 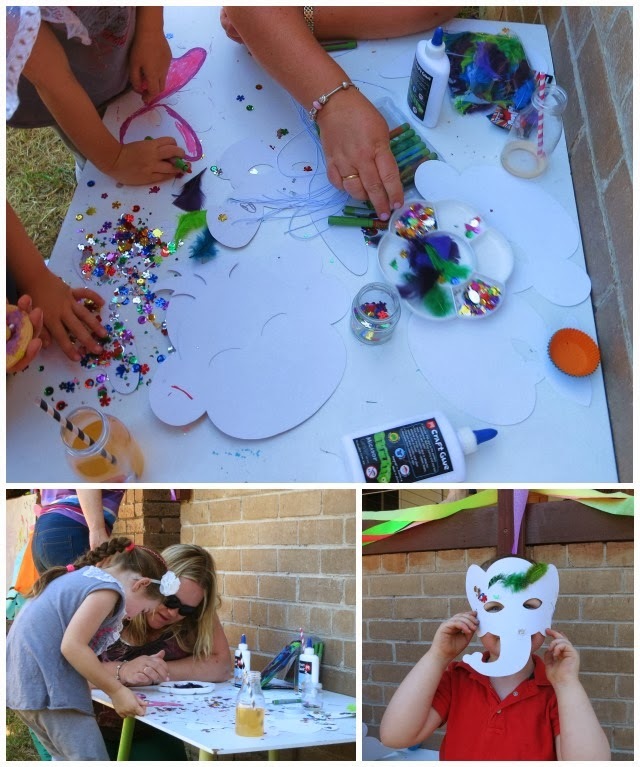 Not all kids made a mask but there were some that enjoyed a lesser active activity. 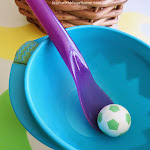 In my experience, kids love a good game of "poison ball" (kids run around and avoid getting hit by the ball) and to fit in with our Arty Party theme, I gave the ball a good roll around in some easy wash paint first. Poison Paint Ball is even more fun than regular poison ball as kids try desperately to avoid the paint! We played it inside our trampoline as it was a good way to contain the ball and paint and made it extra fun and challenging for the kids as the ball rolled and bounced all over the place as they did. The easiest way to wash the paint off the kids (and the trampoline) was with a squirt with the hose. Our party was held in Summer time so this was easy and appropriate for this time of year. They of course had a ball with this too! 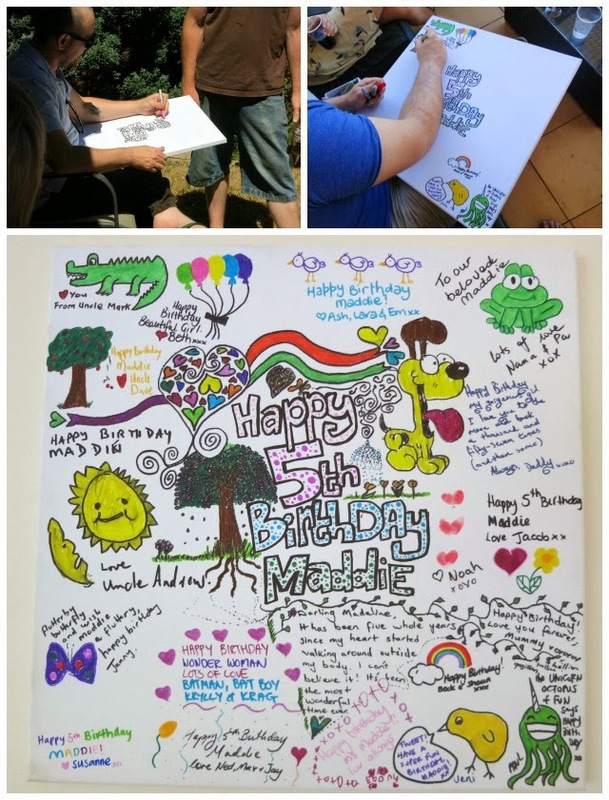 As a special keepsake from her party and as a way to get the adults involved in being arty as well, I organised for everyone to draw a little pic or write a little message on a blank canvas. It turned out so fabulously and she just loves it! Whilst a number of my ideas never came to fruition (let's not talk about all the paint chip bunting that I cut out and forgot to hang!) and I didn't get all the pics that I wanted, (The birthday girl was so busy having fun with all her friends that she was impossible to photograph! ), overall, we still had a fantastic time! Little painting sets made perfect take home gifts for our guests. 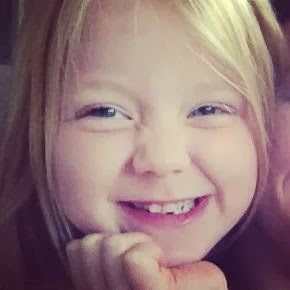 Happy Birthday to my cheeky little 5 year old! Love you. Time for YOU to get arty! WIN the supplies you see us using here. 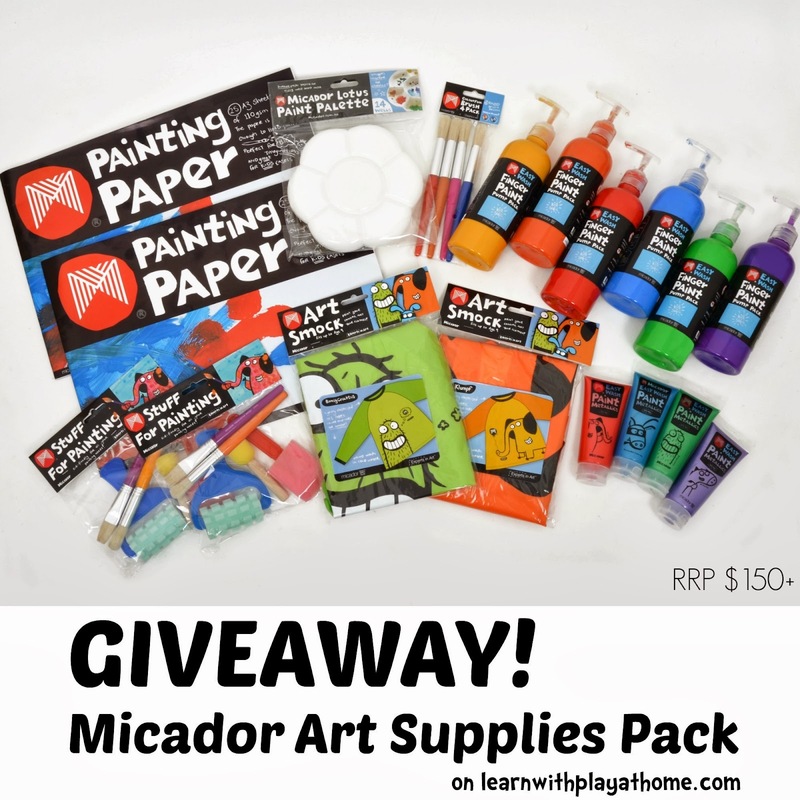 To win, leave a comment on this post telling which of our Art Party activities your kids would enjoy the most. * This is a game of skill and the most creative, original or inventive answer will win. I love your photo's it looked like it was a fun party! I bet Madeline had a ball. Well I haven't had parties for my youngest 2 children yet just family get togethers so far. 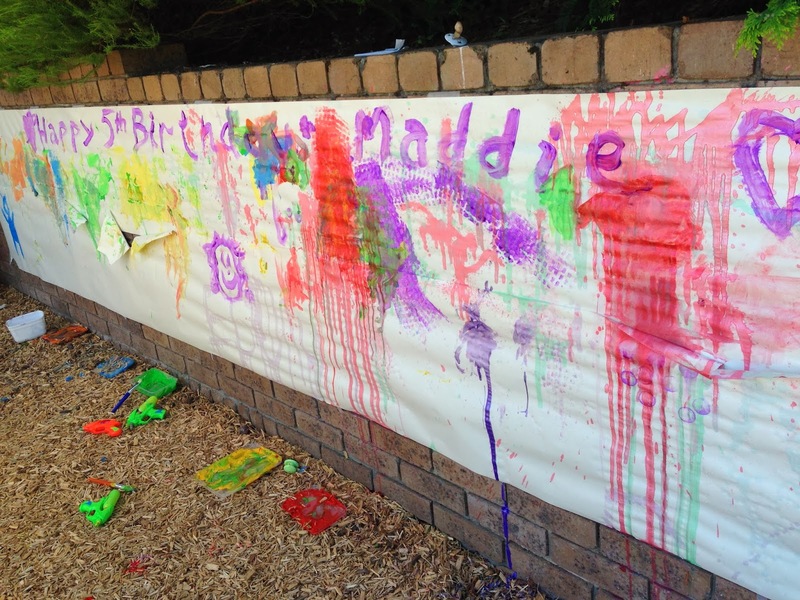 Now a little older and turning 4 in July, a party with a few little friends, I am sure Painting Big would be messy fun with water pistols, rollers, sponges, brushes and our back fence lined with paper would be better than best. Then when the party's done and everyone's gone home we'd recycle their art and stick it to the sides of our kids cubby. With a lot of colour and smiles as wide as Santa's girth winning this prize would excel far beyond it's dollars worth.". The winner has been contacted via email. You must be an Australian resident to enter. You must provide a valid email address and entries are limited to one per household. Entries close Sunday 23rd February 2013 at 8pm AEDLST. One winner will be contacted by email and announced on this post. The winner must contact me within 2 days or the prize will be re-drawn. The winner agrees to have their contact details passed on to the appropriate PR company or brand representative who will send out/organise the prizes directly. Your information will not be used in any other way. You are totally awesome and this is the best party idea ever!!!! I am definitely going to be suggesting this to my two as an idea. 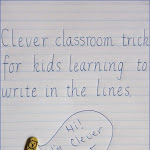 Thank you so much for sharing these ideas and the pictures, I love the canvas idea too. What a great keepsake for your daughter. Hi guys, please leave an email address with your comment so that you can be contacted if your comment is chosen. Even if your comment is the favourite, if we can't send you an email to let you know, we'll have to choose the next in line. I think the big kids (adults) and my kids would love to do the painting. 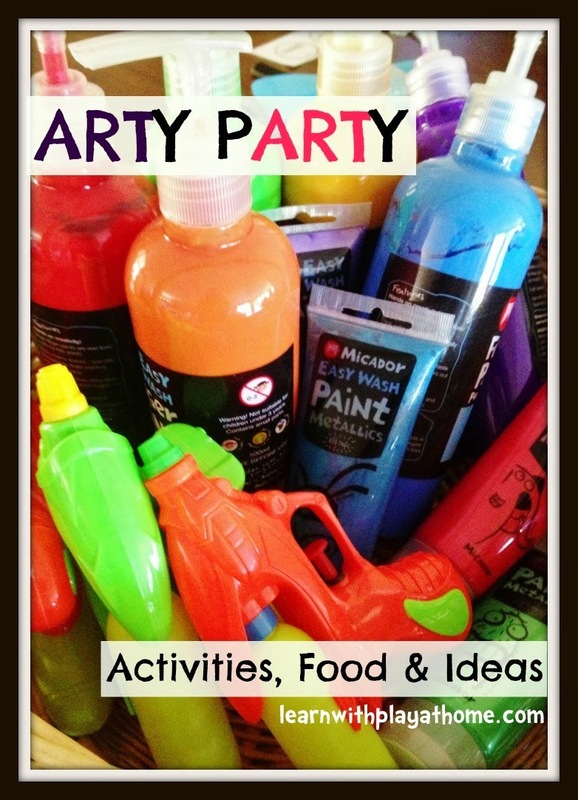 Love this Arty Party idea! I love the Big Paint activity but I think my daughter would love the Poison Ball game the best (not sure what the parents would think of it though!). My email add is gohcindy@gmail.com. Oh I love the rice krispy paint brushes - so creative! I think all the activities look fabulous, I know my daughter would love to paint big with water pistols and squeal trying to dodge the paint poison ball. But I think the one that would resonate with her the most would be the Art Party keepsake canvas. I can imagine her studying all the pictures afterwards and asking who drew which one, and it would make her feel very special. What a great party theme and a fantastic job you have done with the cake! Poison paint ball would be a favourite - any activity that allows the kids to make a mess and expend energy without risk of a consequence from me is sure to be a winner! My little one would simply adore the lovely 'Arty biscuit decoration station' as this activity combines her two loves of art/paint and 'creating' (read playing) with her food. They would love the painting on the long sheet of paper. Thanks for sharing this neat party idea! What a fabulous time you've all had. I love the painting big activity especially with the water guns. My daughter aged 8 thinks the birthday cake is "cool". Great ideas = thanks for sharing them. No really, I love all the activities you provided to the kids and I think the painted ball on the trampoline would have to be one of my favourites. My little girl would probably like the large scale painting though. Great job! & a hose off to finish would elicit a cheer! 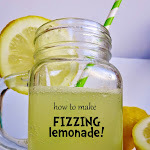 This is such a fabulous party idea! My girls are both summer babies, with birthdays 4 weeks apart... I think that this would be a great double party idea! I love the Painting Big idea - a real keepsake for the day! My girls would love the poison paint ball game - such a great, fun and active game (and I don't care about mess!! ), and what a fun clean up!! However, we have not net on our tramp - so some helpful adult fielders are needed! They would also love the mask making idea - we would probably make our own templates - jaguars/cats and giraffes would be the animals! Thank you again for such great inspiration! What an Awesome Party! looks like fun :) What a great job you did on the Jelly. My kids would absolutely love the big painting! My kids would love this whole party. They are no strangers to mess so my boys would probably say the poison paint ball would be the best thing about the day. My daughter, being younger, would probably stay at the paint big or biscuit painting stations. I really like the cake and favors too! So many great ideas, that's for sharing! What a fantastic idea! I'm already trying to think of ways we could do a similar party for my daughter's birthday. I know she would have an absolute ball playing posion paint ball but as our yard is too small for a party I'll have to put my thinking cap on for how we could play and maybe even party. Thanks for the inspiration! I think the Poison Ball Game on the trampoline is genius! Its given me some inspiration for Dimples upcoming 5th Birthday in April. I will have to borrow that idea :) its awesome! You've captured some terrific photos. Love it all! What fantastic, fun and colourful ideas for a party! 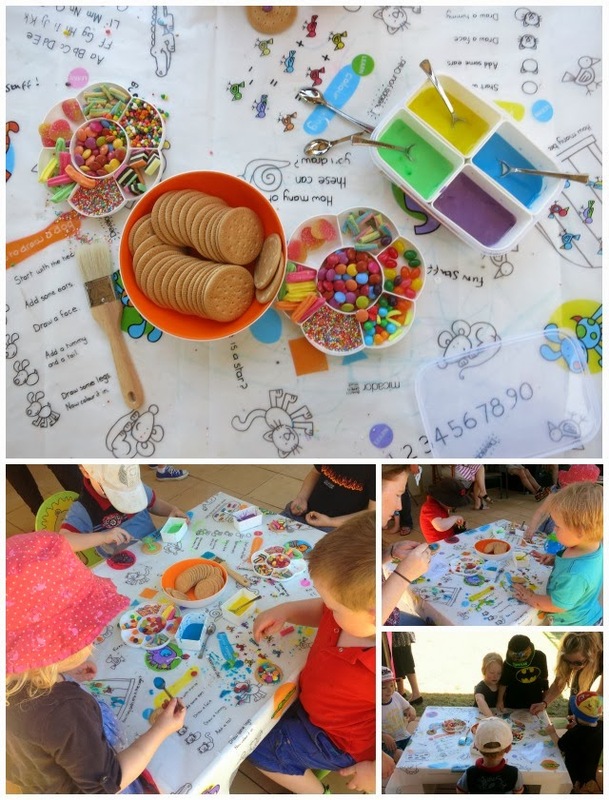 I love all these activities, best of all the arty biscuits. 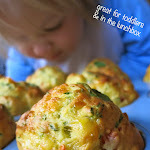 It hits the nail on the head for the two activities my kids love the most in the world - eating treats and doing craft. My 5 year old started Kindy this year, and for his last day home with me I allowed him to choose any activity/outing his heart desired. I was expecting a request to go to a play centre and get milkshakes and hot chips – but what he wanted was to stay at home and make ginger bread men (with smartie buttons). My boys just love decorating biscuits, and your range of colours and sweets are FUN! Thanks for the party ideas. To crafting with such fun! And I'd love to take part! FABULOUS! What a wonderfully creative party. Perfect for a 5th birthday party and kids' creativity at this age is simply mind blowing. My daughter has been asking me to set up an art studio for her (she's dreaming-we don't have the space), so she'd love the Micador set. What kid wouldn't love that Paint Poison Ball game. I think my daughter would love the biscuit decorating, but personally I love all of the open-ended invitations you had set up. Paints! They always want to paint for an "art project"
I love the poison paint ball!! What a great way for kids to bounce some energy out of them and work off some of that sugar! Pretty easy to clean it all up by hosing it down too. But "cleaning up" is by far no.1! My little ones would love it all. Could make their smiles fall. I'd say "Stop. You're faking." Will be getting hosed off by Dad! I am teaching Grade 1/2 students this year and with our classroom being positioned right near the vegie garden, I can't wait to try out the 'invitation to paint big'. I think it will make an amazing mural for the garden wall. Am thinking a combination of paint and natural resources such as leaves, grass, sticks, flowers, etc. This is fabulous and has given me so much inspiration for the paint party I am organising for my 3 year old and 1 year olds party in april. I am going to borrow you biscuit decorating and mask decorating station ideas. And I will also be borrowing the idea for an open invitation to paint on canvas' that they can take home with them. Those will be on top of the major paint fight we already have organised! I cannot wait! This little price pack would seriously help out with the costs of this huge joint party I have thrown myself into! The big painting on the fence is what would get my kids the messiest! Thanks for the opportunity to win! I love this party idea, my daughter would be in heaven! I love the water pistol painting, I never would have thought of that. I think I moght surprise the kids soon, tell them to wear old clothes and we can all shoot at each other with paint, (shower caps might be a good idea though!! My son would love the Painting Big station. He is always experimenting with paint. He loves to roll, splat and brush it on, squish it between his fingers and swirl it together to make new colours. We are down to the last squirts of our paint at the moment and really need to invest in some new art materials. These look great! Poison Paint Ball would be my boy's favourite. It's such a great idea to play it in a trampoline. The ball and the kids are all bouncing while playing this game. Jump laugh, laugh jump! Sometimes I try to tickle my boy when he is on the bed. Our mattress is just like the trampoline and I'm like the naughty 'poison paint ball'. He keeps laughing while jumping and running on the bed to avoid getting caught by me. FINGER PAINTS: There's nothing like watching my children creating a masterpiece by getting back to basics, and getting away from the distractions of modern technology! Followed by Arty Biscuits - they will taste yum! Next would be a game of Poison Paintball. SO much fun he would try them all!! I am a teacher with School of the Air in South Australia. The students I visit would all love the Poison Paint Ball, as they never get the chance to do anything like that. They would also love to do the arty biscuits, what a lovely idea, especially with Easter coming very close and they could decorate Arrowroot biscuits so they get the egg shape as well. Thank you!! I am having serious party envy! The whole event looked so imaginative, creative and fun. I want one for my next birthday! To have an enormous 'canvas' to paint, with no worries about getting messy because of the easy wash finger paint, well both my kids would be captivated for ages. And I wouldn't have to worry about anymore grey hairs popping up! Brilliant idea, that I'll definitely be 'stealing'. Thank you! Art you can eat would suit each guest!